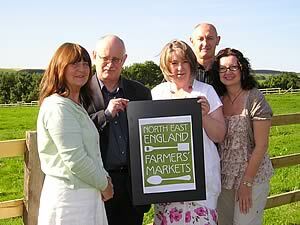 In a campaign to get more people across the North East to eat local food, it has been announced today that over £100,000 of funding has been received to set up North East of England Farmers’ Markets (NEEFM). Bringing together Farmers Markets operated by local authorities, producer groups, private businesses, community groups and social enterprises, NEEFM is the first Farmers’ Market operators collaboration of this kind in the UK. During the initial three year programme they will encourage all these different stakeholders to work together to promote Farmers' Markets in the North East. NEEFM first six members are the Farmers’ Markets in Alnwick, Darlington, Durham, Hartlepool, Morpeth, Newcastle and Ponteland. They have received £97,984 of from the Big Lottery Fund’s Local Food Scheme along with £8,747.89 from the North East England Investment Centre.
" We are delighted to receive this funding, because it means we can ensure that our aims become action. NEEFM is very much a practical resource and this funding will be used to champion Farmers’ Markets across the whole of the North East. We want to give them a stronger voice to actively promote their benefits and encourage consumers across the region to buy, eat and cook with food from their local Farmers Market." There is recognition that City and Rural markets will have differing needs and also areas where tourists make up a large percentage of visitors, so NEEFM will be working in partnership with the region's tourism organisations. Given its remit to encourage people to choose to use the markets as a source of healthy food it also hopes to work in conjunction with the NHS Healthy Eating programme. A recently commissioned government report from the Parliamentary Communities and Local Government (CLG) Committee was keen to emphasise not only these economic benefits but also the significant role these markets play in creating a sense of community. Commenting Labour MP Phyllis Starkey, the committee chair, said successful markets delivered "diverse benefits" to Britain's towns. Using a local Farmers' Market is certainly a way of addressing many of the current concerns we have in the UK such as finding an economical source of healthy fresh food, minimising our impact on the local environment and renewing our sense of community. Farmers’ Markets’ provide valuable employment and have a relatively high economic impact, it has been estimated that every £10 spent with a local food business is actually worth £25 to the local area, compared with only £14 if spent in a supermarket. Not only do farmers markets provide an important extra income stream for farmers, they also regenerate the towns where they are held increasing footfall on market day and encouraging tourists to try a region's specialities. NEEFM has already signed up its first six members Alnwick, Darlington, Durham, Hartlepool, Morpeth, Newcastle and Ponteland. All are members of the national Farmers’ Retail and Markets Association (FARMA) or are working towards this certification which acts as a recognised guarantee of quality.